The pairing of the two legends in a full feature film has long eluded us. We were given a taste of it in Expendables and Expendables 2. But when these two action icons collide, does it make for a must see film in Escape Plan? 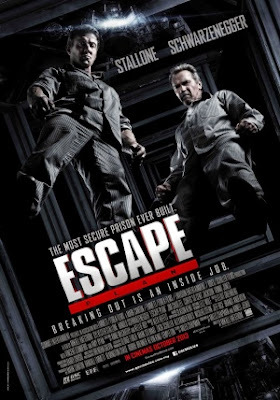 In Escape Plan, Ray Breslin (Sylvester Stallone) is an expert in escaping maximum security prisons for a living. He does so for the government, so that prisoners stay where they're supposed to. But when he and his teams gets an offer to escape out of a secret facility, Ray bites off more than he can chew. Betrayed by his partner, Ray is trapped in the Tomb, created by Willard Hobbs (Jim Caviezel) to be the perfect prison based off a book that Ray wrote. Willard not knowing who Ray is at first treats him like any other prisoner. Life becomes miserable for Ray however when the truth is known. But with every prison that Ray has broken out of, he prepares for this one. First objective is having the right people to support him. 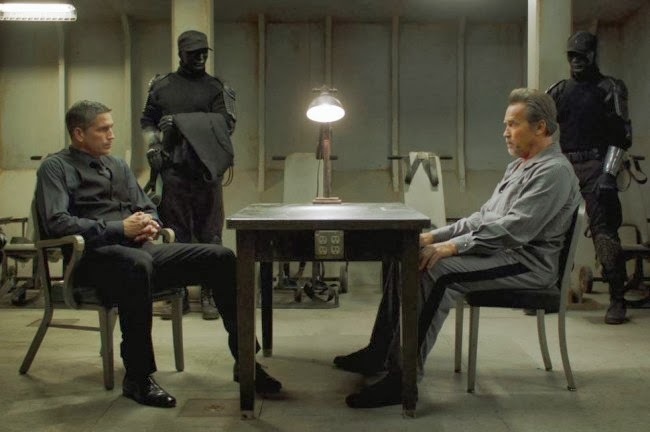 This includes a partnership with Emil Rottmayer (Arnold Schwarzenegger) who befriends him. The only problem is when Ray finds out where the prison is located; it may take more than him and Emil to break out of the facility. The slug fest that everyone has been waiting years for is has finally arrived in this movie. Unfortunately, the fight scene is now between two geriatric actors that looked more like they were play fighting than actually swinging for the fences. To make matters worse that particular scene is quite shorter than one would hope. If you can overlook this, the film is not without its highlights. Jim Caviezel plays the sinister Hobbs quite well. As well, Curtis Jackson, though not seen that often plays his role Hush quite enjoyably too. The premise and plot of the movie is interesting though not quite original especially if you have seen Prison Break on the small screen. While the Tomb is impressive the movie doesn't come into much detail as to why it is supposed to be escape proof given i's design. Overall, I would still recommend the film because of the laughs you get when Arnold and Sly works together. From the posing in front of the security camera when they're attempting a break out, to the corny one liner, the film delivers on good humor and action. The movie while not mind blowing, will keep you glued to your seat for the almost two hours of film instead of wanting to break out.